It pains me that more people won’t read this book, because they may never hear of it. 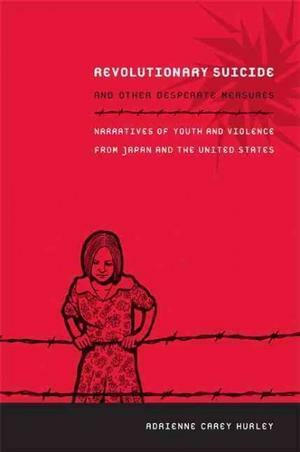 It is richly suggestive and descriptive of the way that frustrated psychological need is disavowed and blown back from generation to generation among Japanese and American youth and their parents. It is an astute and deeply felt text that ties political, literary, psychological narratives together to create a compelling and convincing case that education systems, media regimes, inherited, repetitious ideologies that force victims to author their own oppression can and must be critiqued, as we and our children are paying heavily for the poor regard in which children are held, unbeknownst to ourselves. I cite the case of Japanese international parental child abduction and the lack of any law supporting, enforcing or even legally sanctioning joint custody of children in divorced or separating families in Japan. That is a significant current battle ground of the phenomenon Professor Hurley is evoking in this text: lack of authentic protection of children’s right to full, subjective interaction with both of their parents, lack of authentic institutional defense of family relationships against an onslaught of education system life management, discipline and control of children; excessive time-controlling workplace slavery; and media habituation to empty, often violent, control of children’s inner lives. Couple these with and use them to inculcate and enforce rigid gender identities on children, and you have a recipe for the disastrous loss of human feeling and narcissistic damage that characterizes the relations described in Professor Hurley’s book. This text provides an important antidote to the reductionist arguments about guns and gun violence today, and forms part of just the sort of conversation that ought to be going on instead. Her discussion makes many of the very arguments I most want to make, linking political repression, corruption, contamination, problems attributable to or related with the Japan-U.S. relationship, controlling and numbing education systems, incarceration of youth, and lack of any real opportunity for children and adolescents to develop an analysis of “what’s wrong,” of what is perpetuating the inter-generational cycle so that they can acquire enough agency to offer some self-preserving resistance. The conditions producing parental abduction and the absence of joint parental custody in Japan fit neatly into this argument, lack of attention to which produces deep misrecognition that lack of time for and investment in subjective interaction of parent and child on a mass scale has fatal consequences. This is not a book, despite the title, about suicides; not at all. The title is adapted from Huey Newton, who conceived of the idea and practice of “revolutionary suicide” to express the level of commitment before far greater, more destructive forces, required of those engaged to bring love, respect and social change to those in need, including themselves . I feel that the ideas in this text can help to bring some light into the dark corners of the rooms of left behind parents and abducted children. As professor Hurley wrote, only by “lingering for a while in even the most uncomfortable and awful speculations can we begin to identify the messages (about “personal responsibility” for example) we send that make youths and parents [forced apart by workplace enslavement, and by family court exclusions of parents] want to die.” p. 220. Here is a link to an interview with the author, discussing her book on the Pacifica program, Against the Grain. An appropriate name for a program discussing this much maligned and misunderstood group of people, our kids. Adrienne Carey Hurley is an academic, activist, translator, and youth advocate. She holds a Ph.D. in East Asian Languages and Literatures from the University of California, Irvine . She served as a Court Appointed Special Advocate (CASA) in Orange County. She was awarded a Japan Foundation fellowship for her research on child abuse and youth violence in contemporary Japan. She held a Postdoctoral Fellowship in Japan Studies at the Institute for International Studies at Stanford . She was also the founder and director of the University of Iowa Youth Empowerment Academy. She organized the 2006 “New Nationalisms” symposium with Tomoyuki Hoshino, Chizuko Naito, and Su Tong. She currently teaches East Asian Studies and Integrated Studies in Education at McGill University. Hurley’s translation of Tomoyuki Hoshino’s novel Lonely Hearts Killer was published by PM Press in 2009 and is the first book-length work by Hoshino to be translated into English.